We often over-estimate how much money we will need in our retirement years when we are healthy only because we have this bucket-list of things to do and want to make sure the money is available. The sad part is that not everyone will get to cross off places they want to visit or things they want to do because of the funds aren’t available, health decline or travel insurance is far too expensive. When my father-in-law passed away earlier this year my mother-in-law was left to pick up the pieces which in all honesty was a terrible mess. Shortly after she was deemed unable to care for many things on her own we had to step in and do her finances for her. This is how dementia starts to rob you of your independence, slowly even though we can look back and now see it has been happening for years. With no income coming in but a small Canada Pension Plan cheque which she managed to get early when she didn’t need it that’s really all the money she had coming in. Had she been in the right state of mind that likely would not have happened. Her dementia is based on money and she needs it all the time. It’s quite phenomenal to be honest as I’ve never seen anything like it in my life. Thankfully her survivors benefits are around $1800 but that’s only until she turns 65 years old and then we will see a decline in that number. In order to control the money coming in she only gets an allowance which to many is far more than she really needs considering she no longer drives. Her retirement budget does not balance at the moment and it’s hard for all of us to control what is happening but for the mean-time she gets $100 twice a week deposited to her bank account. That totals $800 a month that she gets to spend on whatever she wants. What does her $800 month target in her retirement budget? Let’s have a look. Any other costs above and beyond comes out of her retirement budget savings account as she has no investment savings. That means if the filter on the furnace needs changing, home maintenance fees and so on. She doesn’t understand that she is getting far more than she needs or that most people get without any retirement savings. You can’t dispute this with someone who is ill with dementia and often it’s easier to just give in and hope for the best. Since she is diabetic she goes to get her eyes tested once a year but that comes with $120 xrays that we pay out-of-pocket but the eye examine is free. Her toe nails get professionally clipped which runs her $75 when needed. She hardly buys any clothes as she as more than enough and any health and beauty she buys is basic since she used to coupon like a pro back in the day and has a nice stockpile. I’m sure she mostly buys hair colour at Shoppers Drug Mart and other medications as needed. We’re still struggling to get Trillium to cover part of her meds since we have to jump through hoops to get her Revenue Canada online code to access her information. Soon, we hope to see this complete so we can perhaps get some back payment or at least some help moving forward until she turns 65 years old when most meds are covered for her. Thankfully there was an unknown pension amount my father-in-law had that was able to cover paying off the mortgage which was sitting around $90,000. For both of them so close to retirement that was still quite a bit of money to be tied to but in all reality this is the norm these days as people struggle to pay to live or go through tough times like they day in their early years with a failed business adventure. The vehicle is on the market to be sold so hopefully that will generate more money to put towards her retirement budget when needed but after that all that is left is the house and any government pensions. All of you already know those are very slim with money if you haven’t saved for retirement on the side over the years which makes any retirement budget very tough. Now that she doesn’t drive we’ve hired a driving companion who picks her up a few times a week to take her around the city shopping and to do things she likes going to bingo, eating out, grocery shopping and sight-seeing. These things are fun for her and when you see her smile you know it’s worth it. This needed service is coming at a cost to her and again more money from her retirement budget that she really doesn’t have. The tough part about dementia is that until you have to deal with it you don’t really know how difficult it can be on everyone in the family. It’s easy to say what you should do but it often goes beyond that until power of attorney has control over the situation. It’s a sad state for many in Canada who are stuck in this situation. Our mental health services certainly could use a boost for those affected with this disease and those suffering along the way with them. Right now her options would be to sell the house and buy something smaller but she doesn’t want to move and when you have an illness that is not deemed viable enough to be put into a home it’s a tough call. Until she is unable to care for herself her ticket to care in Ontario is slim to none. The struggle is when there is no one there to care for her and the kids have moved away. These are things people don’t think about as they age. We believe our children will be around to help us but that’s not true. I’m certainly not around for my parents and if you just so happen to need care that your child can’t offer you then moving in with them may not be an option. Selling the house would free up cash for her and her retirement budget would balance a bit better but at this time we are at a stand-still. Also, the problem with this is that she may believe she has lots of money to spend which turns into a big conflict. She’s on the ball with her money and knows what she has, that hasn’t changed but she forgets what she did yesterday. When you are ill and most likely will be put into a long-term-care facility at some point as your health declines you need money to get the best care. Sad, but true. If you want to live it up in a retirement home that is cushy with all frills then you need the money otherwise you get what you get with what the government sends your way. In her area the costs of living in a home would run her retirement budget $3500 a month but with dementia we would see that number go up. We must be prepared for these types of things, at least that’s what this entire year has taught both Mrs. CBB and I. Not everyone will die peacefully at home without health issues. That’s almost like winning the lottery of life if you can make it that far and pass in your sleep peacefully without the stress of machines, medications and everyone crying over you to pull through. Many seniors fear they will outlive their retirement savings if they have any but I believe the older you get the less money you will need at least spending cash. By the time you are in your 80’s staying home or visiting with family and small trips around town seem to be the norm although you may differ. Preparing for your retirement budget starts far before you retire which means there are a few things you need to consider BEFORE you can plan for the future. Creating a retirement worksheet is a vital part of estimating your retirement needs. How much will my Canada Pension Plan Be? How much will my Old Age Security Pension Be? What is a Survivor’s Pension in Canada? One critical point that I’m sure you’ve already guessed is important to consider is your health. Your health could take a turn at any time or perhaps it already has and you must think about how this will affect you potentially moving forward. Determine your retirement age- What age would you like to retire? Not everyone wants out at 65. Not everyone can afford to retire at 65. Where will the money come from to pay for your retirement budget?- Document all of your sources of income whether it’s savings, investments, pensions. You should be able to estimate what you expect to receive. 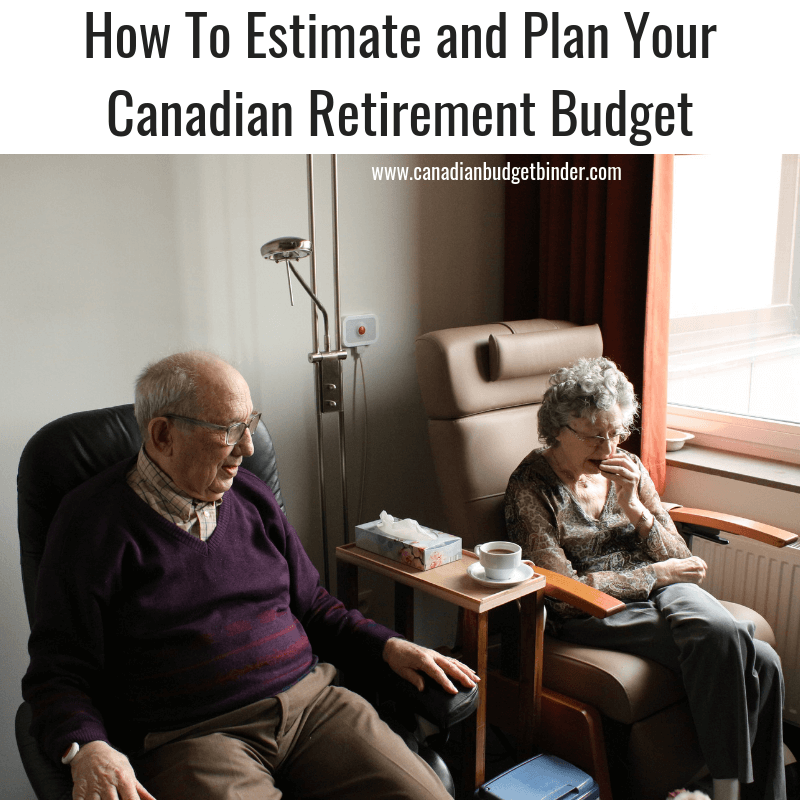 *See the Canada government retirement calculator to easily guide you through this process. Compare your projected income with estimated needs- This is interesting because you should always consider you needs and income ahead of time whether you are retired or not. So, once you have an idea of how much money you will net each month in retirement compare it with your estimated retirement budget to see if you are indeed balancing or at least close to balancing. If not then you need to make adjustments or save more money by working longer, side-income, home business venture, downsize your home, rent rooms etc. Using a Canadian Retirement Income Calculator you can estimate what your financial needs will be but the only category you have control over is your personal spending. This hasn’t changed and will never change whether you are retired or not. The Canadian Retirement Income Calculator will provide you with retirement income information, including the Old Age Security (OAS) pension and Canada Pension Plan (CPP) retirement benefits. You will need to work through a series of modules in order to estimate your retirement incomes from various sources and compare them to your goal income. It also allows you to see the impact of changes in savings behaviour. The calculator will help you better understand how each pillar of the retirement income system will contribute to your future financial security. Retirement money is in full-swing in late 60’s and 70’s where retirees are off and away doing all the things they planned to do with their money if they are still able to. That is the problem with retirement plans because you just don’t know what your health or life will be like once you reach such an age or time where you retire. If you still have a mortgage be prepared that you will have to fund the mortgage with any pensions or guaranteed income that comes your way. No one says you have to retire at age 65 which is why you see plenty of people still working to earn extra cash although some seniors just like to get out of the house. I don’t blame them to be honest but if you have enough retirement savings your options open up where you don’t have to work but rather do the things you’ve always wanted to do but didn’t have the time or money because you were socking it away in your retirement savings. Whether you rent during your retirement years or still live in your family home there are costs involved although they may differ slightly based on a rental agreement and whether or not your mortgage is paid or still pending. By the time you retire you shouldn’t need life insurance any longer as your home will be paid in full but you may still have investments that need managing either by yourself or with a financial advisor. I’d strongly suggest making sure your WILL is up to date and completed by a reputable lawyer. After much investigation Mrs. CBB and I have realized we don’t really need a special retirement budget so we can continue to use the CBB Budget with slight modifications if needed. Your needs will change as should your retirement budget categories so adjust them as you age or as you see fit. Property Taxes, Condo Fees etc. Transportation costs which may include hired help/companion drivers or community assistance, bus passes, parking passes or taxi etc. House maintenance which may include anything to do with maintaining your home such as needed repairs or replacement costs, grass and landscape care etc. As you can see just because you retire and your mortgage is gone you still have quite a bit to take care of financially so making sure that there is some retirement savings is critical. Some of you may be left with no other option but to sell and move into an apartment where costs are lower and fall with-in your retirement budget. Discussion: What other considerations have I missed that you would like to add to this post? Please leave your comments below. I have read your blog off and on for some time now but have never commented before. My husband is going to be retiring at the end of this year and we have worked hard at our retirement plan up to this point. It is difficult as you say with all the unknowns, there are the things we hope to do and the things that might happen to change those plans. I have a question with regards to your statement “By the time you retire you shouldn’t need life insurance any longer as your home will be paid in full”. In your view is the only reason for life insurance to cover a mortgage? I am curious because we have had our mortgage paid off for many years now, but have maintained a life insurance policy through my husband’s work and also one on our own. We have been wondering if we should beef up the non-work one as he will lose that when he retires. Is it smarter to invest the money that has been paying for the insurance policy, hopefully getting some decent interest? That’s a hard question but certainly one I would bring up with your financial advisor as I don’t know what your current policy entails. Your age also plays a role in what route you go. We have term insurance. The purpose of our insurance policy was to have income just in case one of us died. Since our mortgage is paid in full and we are nearing our mid-40’s our advisor is wanting us to go the route of permanent but offered us a few options. The reason for this is that it will be cheaper in the long run, no medicals needed and pay into it for x amounts of years. Even if we don’t use it we still get the money paid back. If we do use it then it is worth more than what we put in from the start.